While some online roulette deposit methods will be new to Canadian players with minimal experience of gambling games on the internet, the majority of players new and old will be familiar with Visa. However some might not have known that Visa is one of the deposit methods you can use to fund your real money roulette account online. If you already have a Visa credit card, particularly one issued by a Canadian bank, the following information could prove particularly valuable to you when you prepare to start playing online roulette for real money. Unlike certain other deposit methods for online roulette, Visa will rarely require players to open up a new account somewhere or enter their personal details on a third-party site. You probably already have a Visa credit card if you are looking for roulette sites accepting Visa, so you will be acquainted with the process of making online payments with this particular banking method. Roulette casinos accepting Visa will generally include the recognisable logo at the bottom of their homepage. When you're ready to start playing real money online roulette, Visa's logo will also be visible on the cashier or banking page, so as soon as you have set up a real money casino account you can click the logo, enter your card details and deposit amount, and start playing for real cash as soon as the deposit is cleared (this rarely takes much time). No requirement to enter any extra personal details: You can just deposit by entering your card number. Instantaneousness: The money will hit your account pretty much straight away after making a real money deposit. High acceptance rates: Even in Canada, some roulette sites accepting Visa will not accept deposits made using certain other less well-recognised credit cards. Use it for withdrawal: Unlike some other deposit methods for playing real money roulette, Visa can also be used as a withdrawal method. Ease of repeated use: An online casino can store your Visa details, meaning you can make any additional deposits quickly and easily. As a large number of Canadian banks will issue Visa credit cards, the company has developed a strong reputation in the world of e-commerce. And this includes online gambling, hence the large number of online roulette casinos accepting Visa. However things may be slightly different if your Visa credit card was issued by an American bank. When it comes to online roulette, Visa is under increased scrutiny in the United States where the legal situation around online gambling payments is different from Canada, so deposits from American-issued Visa cards may be rejected, even at roulette casinos accepting Visa in general. Online roulette sites accepting Visa are a godsend to many Canadian players due to the simplicity of this above other banking or deposit methods. However being able to get your money on and off an online casino is not the be all and end all. Our reviewers have years upon years of online roulette experience, so they know that when it comes to getting a good gaming experience, Visa roulette deposits and a great selection of games is better than real money Visa deposits alone. Our reviewers have found the best online roulette casinos accepting Visa, where you can enjoy great gameplay and many different enjoyable roulette variations, as well as easy banking using one of Canada's and the world's most popular credit cards. What method of deposit an online casino fan uses is very personal, and represents what level of privacy a player really wants. When it comes to speed, security, and flexibility, there are very few methods that can top a Visa. Visa is the leader in online transactions, and with good reason - after many decades as the front-runner, they set the standard of excellence. 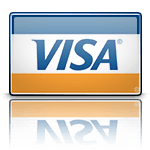 Does Visa allow online casino use? Visa is the most widely used form of online Roulette funding in Canada. While many other credit cards and methods of payment will require additional information and impose a wait time on players, Visa rarely if ever does. While pretty much every online casino in the world accepts Visa, that doesn't mean that every online casino is a quality site. We hope you will stick to the best sites represented here. With over 20 years reviewing online casinos, we know how to spot a dud, and we know what good looks like. Visa is very safe. When it comes to online transactions, Visa has gone above and beyond security, employing top ranked methods of security. Because they back their fraud protection guarantees, they make sure all parties are safe. Deposits using your Visa are immediate. There is no method of payment faster. One major benefit to your Visa is that winnings from the online casino can also go back on your Visa account balance. What better way to win than to keep your money in action? The only fee that most Visa users will have to worry about is if they have a monthly membership fee, independent interest rates, or possibly late payments. Most of Visa's money comes from the merchant receiving your funds. In many cases, there is a fee for withdrawing your winnings, but many casinos will actually absorb this fee. It is always wise to check with your issuing bank and the casino cashier. Hands down, it is the most widely used of all credit cards. The downside to Canadian players who want to use Visa is if the bank that issued the credit card is located in the United States. This will create a problem for you. Other than that, Visa is a leader for online Roulette players.